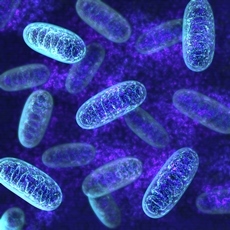 Mitochondrial diseases are a group of metabolic disorders. Mitochondria are small structures that produce energy in almost all of your cells. They make it by combining oxygen with the fuel molecules (sugars and fats) that come from your food. When the mitochondria are defective, the cells do not have enough energy. The unused oxygen and fuel molecules build up in the cells and cause damage. The symptoms of mitochondrial disease can vary. It depends on how many mitochondria are defective, and where they are in the body. Sometimes only one organ, tissue, or cell type is affected. But often the problem affects many of them. Muscle and nerve cells have especially high energy needs, so muscular and neurological problems are common. The diseases range from mild to severe. Some types can be fatal. Genetic mutations cause these diseases. They usually happen before age 20, and some are more common in infants. There are no cures for these diseases, but treatments may help with symptoms and slow down the disease. They may include physical therapy, vitamins and supplements, special diets, and medicines. Article: Therapeutic Prospects for Friedreich's Ataxia. Article: MELAS and macroangiopathy: A case report and literature review.